We work with the best companies in the industry. We have established the strongest bonds with many respected carriers and we offer our students a lifetime commitment to assisting them find the right opportunities for their career. Whether you are interested in working for the biggest companies in the industry or prefer a smaller carrier. Your interests may be to drive trucks over the road and cross county or you may prefer to be more regional or even just locally. We know where the jobs are. They are often waiting for you to complete your training and licensing. The carriers know are students are ready and well prepared. The Demand is there for good drivers. Each one of our locations can provide assistance with filling out new truck driver applications, preparing you for the interview process as well as developing your presentation skills. Our students leave the school ready to drive. 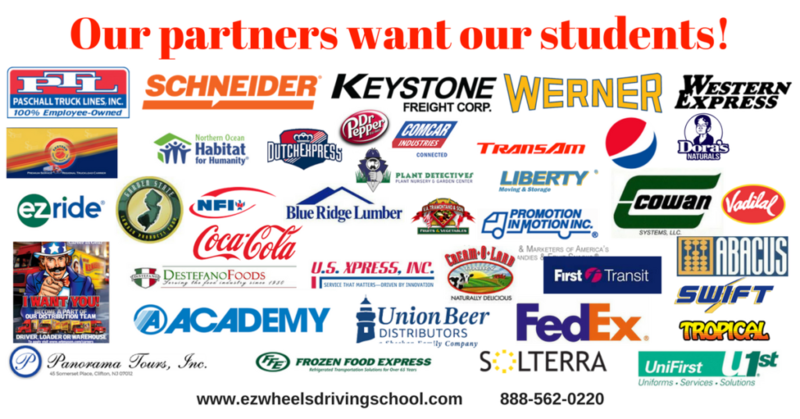 They also leave with the full strength and experience of EZ Wheels Driving School job placement commitment for life.